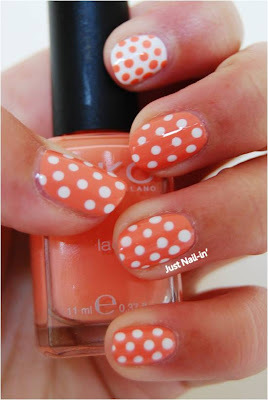 I painted my nails all the one colour, this beautiful peach colour by Kiko. But then I thought to myself, 'What the heck are you doing? You never have a single coloured nails!!' 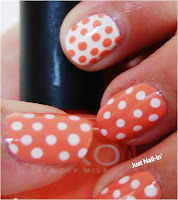 So I swiftly changed them to this cute polka dotted design. Nothing really too it... Just paint your nails a desired colour and polka dotted some dots on the top. I used a dotting tool but you can use the head of a pin, bobby pin, tooth pick or even a old pen/pencil to make your dots.